For the last several years, MicroStation developers have been using the C-style MDL language in which gigabytes of codes are written in the form of utility applications (.ma files), shared libraries (.msl –files), static libraries (.ml – files) and resource files (.r) for graphic interfaces, command tables etc. What is more important, such MDL codes have been maintained and tested to have the best qualities for thousands of hours. There also exist a lot of supported native codes written in DLL to perform time-critical tasks in MicroStation. Such codes can be easily incorporated into MDL programs via dlm set of functions. On the other side, there is a new, modern, easy to learn, platform-independent and object-oriented language called Java and its JMDL extension which enables rapid application development with a lot of advantages for MicroStation programmers such as the usage of pure Java classes from the third-party vendors, safety in memory management, scalability etc. However, Java or JMDL applications seem to have some deficiencies; for instance, they do not look and feel like the MDL application (docking, tool tips, color or level dialog box control etc. ), or the standard Java class library does not support some platform-dependent features rarely required by your application, or their performance is low in case some time-consuming operation is to be optimalised. The Java development kit delivered along with MicroStation/J contains documented and supported specifications of interface that allows the programs written in other languages to be called up from the Java code that runs within Java Virtual Machine. Vice versa, the native code is able to call up methods and access objects written in the Java language. This standard programming interface is well-known in the Java community and its name is Java Native Interface (JNI). If we have read the article carefully up to now, we have already found the answers. Both MDL as well as Java have full, both-direction access to the native code. But it would not be sufficient to make the communication easy if the virtual machines for interpreting these two different codes would run in separate process space. Fortunately, MDL runtime (ustation.dll) and Java/JMDL runtime (javai.dll) are mapped and run within the process address space of MicroStation (ustation.exe). That is why the DLL native code attached to the Java application and then to the MDL application will receive only one DLL_PROCESS_ATTACH message from the first one. Thus, we can speak about an in-process communication between MDL and Java/JMDL. The easiest and most straightforward way of invoking a shared library written either in the MDL or a native code from a JMDL code is to use a mechanism that is very similar to the J/Direct technology. The jmdl_import keyword is a part of a native function declaration in which we specify the MDL or DLL library name and their exported functions which we are going to invoke. The jmdl method succeeding the jmdl_import statement must be declared as static. To use the JNI for accessing the MDL code we need an intermediate native layer for passing calls from Java to MDL and vice versa. 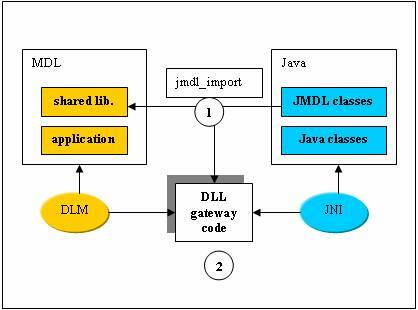 This DLL “gateway” consists of the JNI interface to interact with Java on one side, and on the other side there must be an interface to communicate with the MDL code in a way of a dynamic link module. The header file begins with an include directive for jni.h. In Jni.h there are among other things the data types and function prototypes of the JNI defined. The JNIEXPORT macro is defined in jni_md.h for Win32 platform as __declspec(dllexport). Such a function declaration means that we do not need an additional module-definition (.DEF) file of the exported functions. The JNICALL is expanded into __stdcall which expressesthe definition of the calling convention for Win32 API functions. The JNI imposes a naming style (so-called name mangling) on the native methods through which the Java Virtual Machine links the Java calls to the native methods. So the name of the native language function that implements a native method consists of the Java keyword, followed by a package name (here we have a default package, hence, in our example, this part is omitted), then the class name JavaJni, and finally the name of the native method callDllFunc. Between each name part is an underscore “_” separator. A question may come up about the number of parameters in our Java_JavaJni_callDllFunc prototype where there are three arguments in total instead of an only one. These two additional arguments are passed from Java to all native functions using the JNI. The first of them is the Java Environment interface pointer containing all the necessary function pointers for the native processing of parameters and objects passed from Java. The second one is, in this case, a reference to the current instance of the JavaJni object – an equivalent to “this” in Java. These two parameters make a gateway to call back the Java method but only in the current context of calling. The third one is a corresponding argument to short type passed from the Java code. Now we are prepared to implement calling from a native method. 1. Get a Java Virtual Machine (JVM) pointer – The JNI_GetCreatedJavaVMs function from the JNI library will successfully process your request if the JVM has already been started. The returned pointer will be used in the second task. 2. Get an interface pointer – To obtain a valid interface pointer, a member function of the JVM pointer called AttachCurrentThread needs to be invoked.The function attaches the current thread to the JVM and returns the JNI interface. If the thread has already been attached, no operation is performed, just the valid interface pointer is returned. 3. Retrieve a class reference of the called method – The JNI interface pointer received in the previous task includes all the necessary functions to operate with the JNI. One of them is FindClass which will realize the current task. The returned value is a representation of the searched class. 5. Obtain a requested instance of an object- Because we designed the JavaJni object as a static one, we can use the GetStaticObjectField function to get a reference to it. The input parameters are represented by the class and object identifier. The returned value is represented by a reference to the static javaObj object. 6. Invoke the non-static method- Now we know all the necessary gadgets to perform a call. There is a special function for each type of the calling method in Java. In our case we have designed a method returning the integer type, hence the CallIntMethod function is the right one. The input arguments must be represented by the object reference from the previous step, then the method identifier and the parameter expected by the Java method, in our case represented by the jshort value. Now we have achieved the full interaction between Java and the native code. We are able to call up native functions from the Java environment as well as Java methods from the native code. Our task now is to create a bridge in the native code for interaction with the MDL code. A technology for communicating between the MDL code and DLL is well-known and is described in the MicroStation help texts. Functions from the DLL code can be imported into the MDL code by declaring a function with the nativeCode specification. The native code is able to invoke MDL as well via the documented dlmSystem_callMdlFunction function. Let’s create a C++ file “MDLLib.cpp” to operate with MDL. A first function dll_setMdlFuncCall accepts the mdl function offset as a parameter, gets a MDL task descriptor and saves them into a global variable for later use. The second function dll_callMdlFunc will make use of the saved variables and invoke a particular offset function of the MDL task with one argument of the short type. Finally, we need to create a module-definition file (.DEF extension) to provide the linker with information about exported functions about the nativeLib.dll to be linked. The first one has just been described above, the second one is the Java method invoker function we designed in the section 2.2. Note that the previous JNI function of Java_JNIgo_callDllFunc is exported automatically. 1) Add the native declarations to the global part of the mdl module corresponding to the function declarations in the Import.dls file. 2) Create a function mdlOnJavaCall to be called from the native DLL library nativeLib.dll by the function Java_JavaJni_callDllFunc which has been called by the Java class JavaJni from the method callDllFunc. The technology of interaction between Java/JMDL virtual machine and MDL gives us possibility to utilize existing MDL code for new language platform without needs of rewriting an existing code into Java. We can concentrate on new features of Java language when designing new applications without loosing low level accessing capability of our software. The examples given in the article are for learning purpose so I removed all errors and exeptions handling for shorter code. The code was tested on MicroStation v. 07.01.01.36, and native library was compiled using Microsoft Visual C++ 6.0. I found your site while searching for an MDL compiler. MDL (pronounced “muddle”) was a modelling and simulation language, related to lisp in many ways, developed my MIT under a DARPA contract during the height of the cold war. The once popular game Zork was originally written in MDL by MIT students, but later translated into more popular languages. I’ve located the original Zork Code, at http://simh.trailing-edge.com/games/zork-mdl.zip, and an interpreter (“confusion”) written to support a subset of MDL, and the manuals (at http://ifarchive.plover.net/if-archive/programming/mdl/manuals/Index) but I’m trying to find the original MDL interpreter and compiler.